If there’s one undeniable assertion that can be made about fiend-friendly filmmaker George Romero’s lifetime zombie fetish, whether you love or hate him, it’s that his Undead movie series lives on as surely as his claim-to-fame perpetually reincarnated screen corpses. 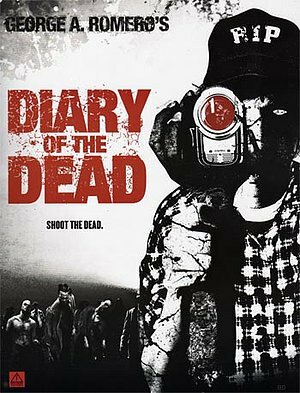 Beginning with the cult guru’s 1968 cannibalistic classic Night Of The Living Dead, Romero’s subsequent Living Dead trilogy was resuscitated and further fleshed out, so to speak, most recently with his 2005 Land of the Dead. But less manic than introspective, and closer in its raw faux-documentary sensibility to the 1968 original, his latest, Diary Of The Dead is both derivative and reverential in concept to Night Of The Living Dead, and also cutting edge – no pun – in its anchoring to contemporary times, and the ironic simultaneous shackling and liberating impulses that mass cyberspace existence signifies today. In other words, the younger generation simply has no idea when it’s time to let go of that web cam and palm pilot, and run for your life. Cloverfield meets No Country For Old Men. The plot, which is nearly incidental to Romero’s musings about human depravity and the inner basic instinct monster clawing its way out, focuses on a group of Pennsylvania college students fleeing in an old Winnebago, the sudden assemblage of flesh-famished zombie hordes. Debra (Michelle Morgan) does online blog duty as the narrative voiceover of this horrific misadventure, while Jason (Joshua Close) digs in for the duration as the designated film director to whatever bitter end. But in a new, technically determined world where the recording of life is equally prioritized with living it, the frantic survivors make ill-advised decisions connected to taking it all in as a film-in-progress, which needlessly and repeatedly exposes them to bodily harm, much of it ill-fated. So out of touch and perpetually on pause are these young people within the actual world, that it takes quite some time for them to realize, long after we do, just what extreme danger they’re actually in from these zombies. One student even suggests quite seriously, that they just take to their Nintendos until the entire crisis of survival blows over. The point here may be that human nature is so steeped in fantasy through gadgets today, that zombies may hardly seem more real than what’s up on a screen. There are also those darker psychological urges that are liberated in the midst of a more primitive reality taking over, as less empathetic types takes to torturing the zombies for sport, caught in several gory images of an undead female hung by her hair from a rope, her flesh shot to pieces, and a man strung up by his neck over a road as cars crash into him like a parkway pinata. More psychologically than viscerally spellbinding, the movie is smartly scripted, and a macabre, strangely poetic and apocalyptic cautionary tale for the cyber-generation. Romero’s parting thought in Diary Of The Dead, clearly a lament for a survival-of-the-foulest mentality that seems to scare him a whole lot more than any monster, comes down to, ‘are we worth saving.’ In that sense, Romero elevates the gore genre quite a bit as he doesn’t just merely depict violence, but contemplates and mourns it.